These sturdy plastic plates make seep-through a thing of the past. 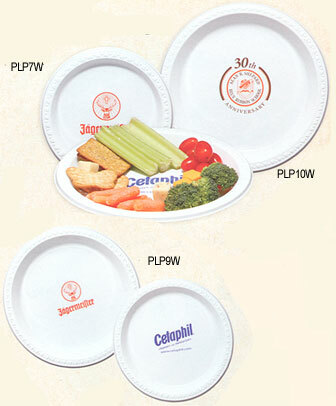 You can imprint your company logo or message on 7, 9, or 10 inch plastic plates. It is easy to get started with our Custom Printed Plastic Plates, just call 1-800-233-0828. PLP7W 7" Plastic Plate: White N/A .57 .48 .46 .44 .41 .38 CALL CALL 3"
PLP7C 7" Plastic Plate: Colored N/A .54 .43 .39 .33 .32 .30 CALL CALL 3"
PLP9W 9" Plastic Plate: White N/A .80 .67 .60 .56 .52 .50 CALL CALL 3"
PLP9C 7" Plastic Plate: Colored N/A .76 .62 .57 .55 .52 .50 CALL CALL 3"
PLP10W 10.25" Plastic Plate: White N/A .92 .81 .72 .64 .58 .56 CALL CALL 3"
$40.00 one time set up charge. Yellow, Red, Ivory, Black, Green, Blue, Purple, Burgundy, Silver. We cannot guarantee match on dark colored items. For additional information on our Custom Printed Plastic Plates or our Bar, Nightclub, Restaurant, & Catering Supplies, including Lighted Ice Cubes, please contact us at 1-800-233-0828. Feel free to browse our selection or Custom-Imprinted Glassware, Custom-Imprinted Plastic Glasses, and Neon Serving Trays.